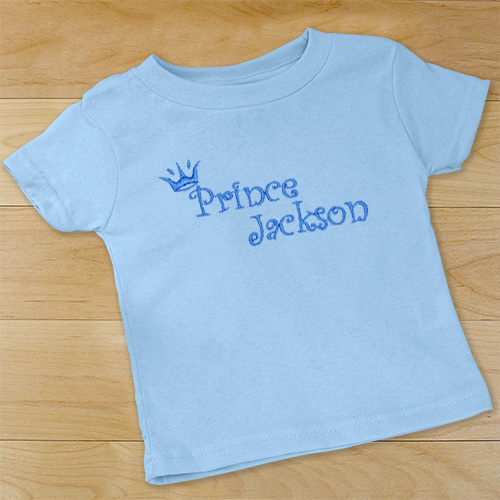 Adorn your little prince in his very own Personalized Prince bodysuit featuring regal blue lettering on a soft and handsome light blue bodysuit. He will look dapper and ready to save the princess from the castle at a moments notice. Personalized Baby Gifts like this Embroidered Baby bodysuit is available on our premium 5oz, 100% light blue cotton infant bodysuit with crew neck, double-needle hemmed sleeves and binding at the legs with three snap bottom. Machine washable in infant sizes NB-18 mos. Includes FREE Personalization! 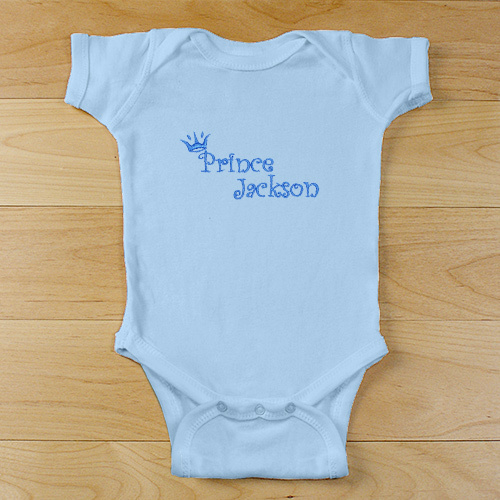 Personalize your Prince Baby bodysuit with any name ( ie. Jackson ) . Additional Details GiftsForYouNow.com offers many unique and handsome Personalized Baby Apparel Gifts perfect for your little prince. He is certain to look great in his stylish baby apparel, personalized just for him. Shop GiftsForYouNow.com for all your Personalized Baby Gifts today.